Don't call it a fluke, Weidman did what he aimed to do. After months of excitement leading up to the UFC 168, the final moments seemed somewhat anticlimactic, or at least unfair. Anderson Silva, the G.O.A.T., reduced to a heap on the mat after breaking his leg. 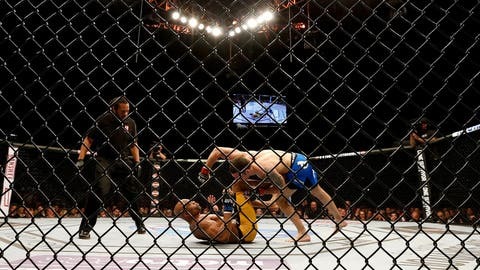 Some described it as a fluke, but that’s a characterization the champion’s camp strongly objects to, particularly after spending so much time on the ‘Destruction’ checking technique that Chris Weidman used during that fateful moment when Silva stepped forward and fired off a full-power kick that Weidman caught just below his knee. "It’s 100 percent a legitimate technique that he prepared for this fight," Serra’s cornerman and former UFC champ Matt Serra told FOX Sports after the fight. "I feel for the guy, his leg’s hurt, but the thing is this: in the first fight, Chris got some criticism for eating leg kicks. What did we do? We addressed it. Longo showed him the destructions. The harder you kick with those things, the worse it can get for you. If we’re playing a game of chess, he made the right move. If he’s not checking that, he’s eating that. If you eat a few of those, the fight could have gone in a different direction." Weidman’s chief trainer, Ray Longo, who taught Weidman the technique, felt that the fight was so clearly trending in the champ’s favor that the result — a Weidman victory — was a foregone conclusion. After all, in parts of four rounds over two fights, Weidman landed more strikes, took Silva down twice, dominated both complete rounds, knocked him out with strikes once, and knocked him down one other time. "Anderson will never beat him," Longo told FOX Sports. "It’s not going to happen. I do believe it’s not taking a thing away from Anderson. He’s one of my favorite fighters, but I think at this point in his career it’s diminishing returns. Chris is a young, strong kid who’s not going to be intimidated. He’s a force to be reckoned with. His wrestling is sick, his jiu-jitsu is off the hook, he’s got a great chin, he kicks like a freaking mule. He’s indestructible." That theory will soon be tested by Vitor Belfort, who has continued a remarkable rebound and cemented himself as the No. 1 contender with three straight head-kick knockout wins. While in the eyes of some, Weidman has yet to truly cement himself as the best middleweight of the world, to his coaches, he did exactly as he trained to do, and earned a win by using a technique that is designed to turn defense into offense.